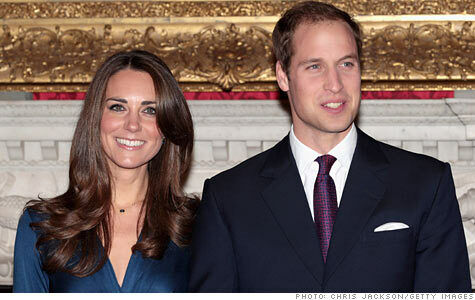 LONDON�(CNNMoney.com) -- Prince William and Kate Middleton's fairytale romance begins a new chapter on April 29. So too does the business owned by the family of the future princess. Kate's middle-class parents, Michael and Carole, are the owners of Party Pieces, a party supplies business that sells everything from balloons and bunting to cakes and confetti. Thanks to their entrepreneurial spirit, over the last two decades the company has gone from a little start-up to a family firm that today claims to be "the UK's leading online and catalog party company." And now with the royal nuptials pending -- Kate and William will marry in Westminster Abbey on April 29 -- the public profile of the venture has surged. Having a link to the royal family establishes instant credibility for the firm, said veteran publicist Michelle Tennant, who is also co-founder of Wasabi Publicity. "It creates awareness, boosts sales and establishes credibility, and that's the biggest challenge for small businesses -- establishing credibility," she said. The royal engagement boosted traffic to the Party Pieces website tremendously, with U.K. visits surging 163% the week William and Kate made the announcement, according to data compiled for CNNMoney by Experian Hitwise. James Murray, an analyst at the web metrics firm, expects traffic to keep rising in the run-up to the wedding, although it might not achieve that initial peak again. Carole Middleton was a stay-at-home-mom when she launched Party Pieces in 1987, when Kate was just 5. She started it out of frustration at not being able to easily find affordable party bag presents for her own children's parties. The business grew to the point where Michael quit his job as a flight dispatcher to help run it, and it's evolved from a mom-and-pop outfit run out of a shed in the family's back garden into a venture operated out of three converted farm buildings in Berkshire, about an hour's drive from London. The success of Party Pieces has afforded the Middletons a home in the affluent village of Bucklebury, where the average residence is valued at $1 million, according to property site Zoopla, as well as provided the means for them to send Kate to some of the priciest private schools in England. The business has grown to about 30 employees, but it's "still very much a family business," Carole Middleton said in an interview with the company magazine in March 2010. "I am still actively involved and love sourcing and developing new party products," she said. Kate and her younger siblings, Pippa and James, have grown up alongside the family business. "Both Pippa and Kate used to model for the catalogs, wearing t-shirts with their ages on them and holding cupcakes," Claudia Joseph, author of "Kate: The Making of a Princess," said in an e-mail. In that respect, Party Pieces is like most family ventures. "The rate of children working for the family business while students is virtually 100%," said Wayne Rivers, president of the Family Business Institute. "There's always something to do." With the growing frenzy surrounding the royal wedding, Party Pieces has benefited from instant fame. In some ways, it's been "a bonanza for the family and for the family business," said CNN royal contributor Mark Saunders. "They are probably the most famous party planners in the world." It's unclear whether the increased awareness of the firm has boosted sales. Since it's incorporated as a partnership in the U.K., Party Pieces isn't required to disclose its financials, and the family is famously tight-lipped when it comes to speaking to the press. When seeking comment for this article, Party Pieces said it did not employ anyone to handle media requests. However, the engagement has undoubtedly given them a huge profile they never would have had before, noted Sandra Macleod, group CEO of Echo Research, a firm that specializes in reputation research. "Suddenly the organization has been put on the map," she said, adding, "it will survive on the oxygen of word of mouth." But being thrust in the limelight can also have its drawbacks. Since the engagement, British tabloids have published reports claiming the Middletons are capitalizing on the royal wedding by stocking British-themed street party items, such as flags, streamers and other festive decorations. "The media profile can become toxic if they are seen to be overly profiteering or mercenary," Macleod said. "They just need to be careful that they don't step on the wrong side of tastefulness." There's also the question of whether, as a business, they'll have the capacity to meet demand if rising interest in the royal wedding does translate into more orders, said Tennant. With a little more than two weeks to go before the ceremony, interest -- and scrutiny -- is probably going to be at its highest. But Tennant noted, it isn't going away, and the Middletons will have to decide how to handle what she described as "a beautiful opportunity" for the business. "For a small business like theirs, the first priority is to respect the royal family and Kate's wishes. Once they get their wishes met, then they can look and see that in the long term everyone is going to know who they are," she said. While the business is gaining newfound recognition, it's also losing a key member of staff. Party Pieces has been a central theme for nearly all of Kate's life, but as a royal, she'll be expected to focus her attention on charity work. She's already stepped down from her post at the company but isn't kicking her feet up -- after all, there is a party of the century to plan.